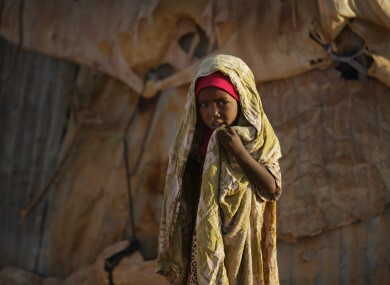 A young Somali girl stands outside her makeshift hut at a camp of people displaced from their homes elsewhere in the country by the drought, shortly after dawn in Qardho, Somalia. THE WORLD FACES the worst humanitarian crisis since 1945, a top United nations official has warned. Stephen O’Brien, the UN under secretary-general for humanitarian affairs warned that immediate measures needed to be taken to address the looming famine in a number of African countries. O’Brien told the UN security council in New York yesterday that action had to be taken to stop people simply “starving to death”. “We stand at a critical point in history. Already at the beginning of the year we are facing the largest humanitarian crisis since the creation of the UN [in 1945],” O’Brien told the council. O’Brien was speaking on his return from Africa, where he toured Kenya, Yemen, South Sudan and Somalia – all countries that are in the middle of or facing famine. He warned that without a concerted collective effort by the world’s countries people risked starving to death and succumbing to disease; he said there would be stunted children, mass displacements and reverse development gains. Famine was recently declared in a number of regions in South Sudan in central Africa, where a protracted civil has led to food and aid supplies drying up. The UN has previously warned that hundreds of thousands face starvation there. “The famine in the country is man-made. Parties to the conflict are parties to the famine – as are those not intervening to make the violence stop,” said O’Brien. O’Brien said that in Yemen in the Middle East about two-thirds of the population (more than 18 million people) needed assistance, including seven million who were severely food insecure. “I continue to reiterate the same message to all: only a political solution will ultimately end human suffering and bring stability to the region,” he said. The UN has previously said it needs to raise $4.4 billion by the end of this month in order to alleviate the crises and suffering in the affected countries. In Somalia in Africa – which suffered a famine in 2011 – over half of the population (6.2 million) are in need of aid. Meanwhile, in Kenya, O’Brien said that 2.7 million people were food insecure. He said that the various humanitarian disasters could only be avoided with collective action. It is possible to avert this crisis, to avert these famines, to avert these looming human catastrophes,” he said. Email “World faces worst humanitarian crisis since 1945 - UN official ”. Feedback on “World faces worst humanitarian crisis since 1945 - UN official ”.